Smitten: Serendipity Stamps Challenge- Anything Goes!! Happy, Happy World Cardmaking Day!! Welcome to the Serendipity Stamps Challenge Blog! 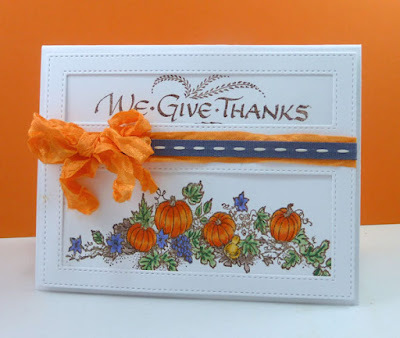 We love seeing what you make with your Serendipity Stamps and Dies. The challenge begins on the first of the month with a central theme. The design team provides samples for inspiration at the beginning, and then again at the half way point of the challenge, but you get a whole month to join us! At the half way point we'll be showing another round of samples as well as celebrating with a monthly blog hop - showing you the latest products and offering another chance for you to win some goodies from Serendipity Stamps. SSCB#60 Anything Goes!!!! Make whatever your heart desires :-) Whatever you choose just be sure to include at least one Serendipity Stamps image (stamp or die) on your design! Want to go shopping? The stamp of the month for October is the Pumpkin Border. I stamped the Pumpkin Border onto PTI Select white card stock and colored with copics in autumn colors- whoa I am hardly believing that we are in to fall- it is finally cooling down here a little and I'm sure in a few months I'll be gripping about the cold weather BUT- I need to enjoy this season while it's here. The sentiment is Serendipity's We Give Thanks. I love your colors and also, thank you for reminding me that you don't have to color every little thing. I tend to do that! Love your card! Especially that you left a lot of white space in your stamped image! And love that wrinkly orange bow!